Our Wild Birds: Front Row Friday! 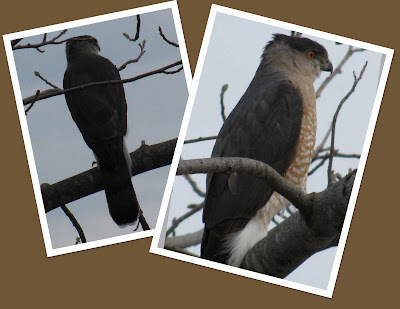 Today, at the bank, I came across a beautiful Cooper's Hawk hunting the road. Using my car as a blind, I caught these pretty good pics. I am sure that the people in the drive through could NOT figure out what this weird woman was doing creeping her car slowly, slowly slowly around the parking area. In the end, I think the time spent paid off. then went inside to write a quick entry... So here we are. I had just begun and crackle, crash... huh?? What's that!? 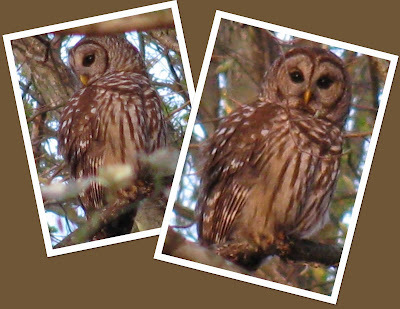 The Barred Owl was in hot persuit of something... well... someone. When s/he got back up on a branch it was apparent that they were not successful. It is so hard for them to catch food - I am always amazed when they make a catch.